Thursday was Rams’ head coach Steve Spagnuolo’s first official day on the field with his new team as the Rams began their three day minicamp with a morning and afternoon workout session. 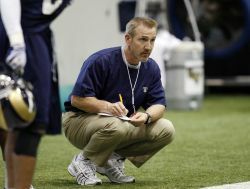 Spagnuolo (picture by Bill Greenblatt, UPI) has three objectives in this first minicamp. Evaluate talent, learn how to practice, and build on the basic fundamentals. The media has had limited access to the team as Spagnuolo hopes to block out all outside distractions so they can get off to a good start and go from there. Veteran quarterback Gus Frerotte was supposed to be at camp, but a free agent deal wasn’t signed yet. The Rams now want to wait until after the draft. Meanwhile, the Rams have scheduled a pre-draft visit for USC quarterback Mark Sanchez later this month. The Rams have the number two pick in the draft. Are those two things tied together? I’m sure you heard the Bears traded for Jay Cutler. They also signed former Rams pro bowl left tackle Orlando Pace to a three year $15 million dollar deal. The Rams cut Pace three weeks ago. As the Rams look to fill a hole at left tackle, they are moving Alex Barron from right tackle to left. Barron is familiar with the position. He played left tackle in college and filled in when Pace was hurt.